Recently, I was at the UNLV campus visiting the Gaming Research Center that is on the third floor of the Lied Library. I do this from time to time as a point of review, and to stay sharp on advantage play techniques and insights. There is a special collections section at the center where almost every gaming book and academic paper ever published on the topic resides. It is easily the most complete gaming book collection in the world. Some of the books are classic text on a variety of advantage plays and some are essential reading for the aspiring professional player, while others are sheer rubbish and not worth the paper they’re written on. The visit led me to reflect on all the books and articles I have read on advantage play over the years, which is somewhere in the neighborhood of hundreds and thousands respectively. Four books stand out among all other texts that have been written on the subject. This is not to say that these are the only ones worth reading, and there are dozens of authors that have made significant contributions to advancement of the field. And I will give those books an honorable mention toward the end of the piece. But these four in my humbled, but informed opinion are keystone text that one is able to derive all of the most essential advantage play techniques from. The first of the four books should be no surprise to anyone who has studied gambling, even at the most superficial levels. 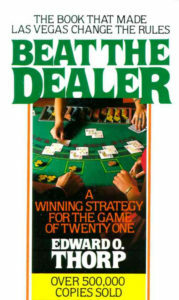 In 1962 Ed Thorp published Beat the Dealer. It was the first scientifically based text on the subject that was widely distributed among the public. The idea a casino game was beatable was a completely foreign concept to the general public and this book brought the ideology front and center for all to see. The ideas in Beat the Dealer were developed in the time when single deck blackjack was the dominating table game in Las Vegas. The introduction of Thorps book caused Las Vegas to alter the rules of the traditional 21 game, but the original rules were quickly reinstated shortly after the change in the rules caused the guest of the Las Vegas hotels and casino to practically vanish. As additional decks and rule changes were added to the traditional single deck game, Thorps original analysis had to be modified. There have been a variety of authors and players who have attempted to put their spin on the Thorps ground-breaking work, some do it justice while others fall well short of that goal. Long time professional player and author, Henry Tamburin PhD, in his online document, The Ultimate Guide to Blackjack published on the 888casino.com blog, does a solid job of putting Thorps original analysis in a framework that is consistent with the modern era. Professor Thorp will be publishing a new book in late January, 2017. A Man For All Markets is a reflection on his life, his influence on Las Vegas and the Stock and options markets as well as offer advice on the general business of life. The second of the four books I find essential in the advancement of advantage blackjack play is Peter Griffins: The Theory of Blackjack. This book broke down every aspect of blackjack in a strict mathematical approach. The entire book reads like a high level math text. Essentially, it is one proof after another, using multi-variable calculus in both integral and derivative aspects. A lay person flipping through it on a casual basis would likely be put off by the page after page of equations and quickly discard it as not being worth the effort. But like most things in casino gaming, the opposite is true. The approaches by Griffin outlined the fundamental proofs that the aspiring game theorist should apply to their analysis of any game they are trying to solve. Simply stated The Theory of Blackjack was a blueprint for future advantage players to follow when determining what questions to ask when they are developing new strategies. It also provides general directions for the hopeful problem solver. Ken Uston’s book Million Dollar Blackjack is the third book in the quartet of required reading. Ken Uston even after his death remains one of the most controversial players in the history of the game. MDB is an amazing book and Uston’s breakdown of complex ideas to simple and understandable form remains his greatest achievement. The book introduces a variety of new concepts like the introduction of a multi level counting system and ace side counts. Gaussian distribution curves on hit frequencies of the most frequent win percentage, as well as comparative analysis between multi level counting systems and single level system are among the new Ideas introduced by Uston in MDB. I have found something new in the book every time I have read it. Beyond Counting Exhibit CAA is arguably the most advanced text ever written on the subject of Blackjack and the other aspects of casino gaming. It is also one of the rarest. Only 1000 copies were printed and you had to be screened by the author and approved to purchase the book. The original price was $250 but the when a copy of the book does come up for sale on Ebay, the price approaches $4000. The 700 page book reads like math text book in some places and a sarcastic commentary in others. It evaluates games like 3 card poker, Caribbean Stud and even discusses approaches on the big six wheel and roulette. I humbly admit I did not grasp every concept on the first go through. Most players, including me, only apply one or two chapters to at a time. This leads to more than adequate profits for the dedicated practitioner. James Grosjean who authored Beyond Counting Exhibit CAA is considered by every AP to be the best in the business when skill is measured by dedication, desire and analytical ability. The Grosjean Cup that represents the title of the world’s greatest blackjack is awarded every year at the annual Blackjack Ball. It was named after James after he was barred for competition 7 years ago because he took first or second every year in the decade prior to his being banned from competing. These four books in my experience make up the most important books in advantage gaming to date. There are a few additional authors that also have made very impressive contributions to the advancement of advantage play. Professional Blackjack by Stanford Wong and Playing Blackjack as a Business are two classic texts. Anything by Arnold Snyder is a good starting point for most novice players. Lastly, Turning the Tables on Las Vegas by Ian Anderson is a great read with equally great insights. Nicholas is the Managing Director of Alea Consulting Group, a casino gaming consulting firm with a player centric philosophy. It is staffed with world class players, gaming authors, mathematicians, top legal minds and a variety of industry professionals. Follow Nicholas and Alea on twitter @byth3numb3rs.